Steve Colgate designed the Colgate 26 to be a fun small racing sailboat, with built-in features for maximum racing efficiency as well as day sailing comfort. With experience in one-design keelboats, center boarders and ocean racers, Steve thought a lot about sailboat design features that would make the Colgate 26 such a great boat for sailboat racing. There are Colgate 26s in many PHRF fleets across the country. We could go on and on, but why don’t you give Steve Colgate a call, set up a test sail, and find out yourself why the Colgate 26 is so much fun in round-the-buoy sailboat racing competition. The Colgate 26 has superb handling characteristics for seasoned racing sailors and sailors who want to learn to race. Rather than just go for a test sail, sign up to participate in one of Offshore Sailing School’s sailboat racing classes, with expert coaches on the school’s Colgate 26 fleets. The Colgate 26 is the boat of choice for the annual North U/Offshore Sailing School Performance Race Week held each Spring, and the Winter Go-For-The-Gold Racing Clinic offered by Offshore Sailing School – both in Southwest Florida. The U.S. Naval Academy took delivery of 12 identical Colgate 26s for Collegiate Racing in December 2015, adding to their existing fleet of 30 Colgate 26 trainers. Those 12 “Navy 26s” had to be built with less than one pound difference between the boats! The U.S. Coast Guard Academy, Maine Maritime and other institutions have chosen the Colgate 26 for training and racing too. We have a winning combination in the Colgate 26. We have a stable, roomy platform for instruction at all levels, a sporty racer that appeals to the college sailor, and a boat that meets the high safety expectations of the Waterfront Staff at Maine Maritime Academy. The Colgate 26 is such a great boat for racing, The Leukemia & Lymphoma Society asked Offshore Sailing School to donate a minimum of 10 Colgate 26s - four times - for its Leukemia Cup Regatta Fantasy Sail Weekends. Those "thank you" regattas, which bring in Leukemia Cup Regatta top fundraisers for a weekend of racing, parties and seminars were held three times at Offshore Sailing School locations in southwest Florida and the fourth on the Hudson River from Jersey City, NJ. The Colgate 26 has also been the boat of choice for the Knickerbocker Cup – an international match racing event held on Long Island Sound. 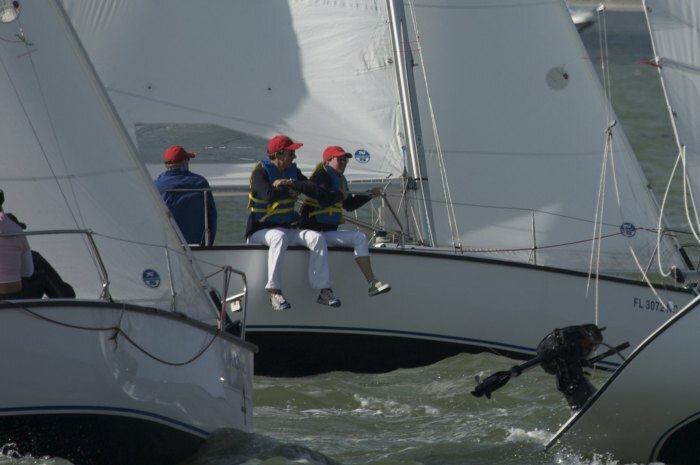 For three years, sailors from all over the world sailed the Colgate 26 – some donated by Offshore Sailing School for use in this event, others privately owned. The sailors all commented on how forgiving the Colgate 26 is, how easy it is to roll tack and spin on a dime, how few breakdowns occurred in wild winds with so many stresses put on the rig by such avid racing sailors. The quote below is from Dave Perry, who skippered a Colgate 26 in these events and is the author of numerous books on The Racing Rules. 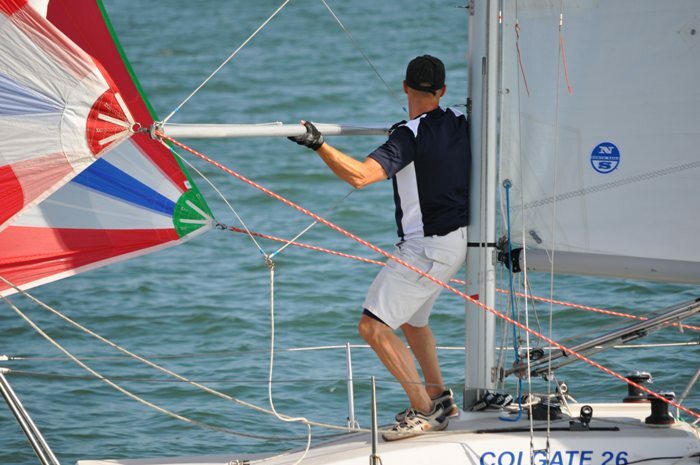 In addition to the features above, the Colgate 26 comes in very well when rated for Performance Handicap Fleet Racing. Here are some examples of PHRF Ratings. Please check with your local race officials for more information and PHRF updates.